Looking for a crib mattress that's truly organic? This one is pricey, but may be exactly what you need---and Naturepedic has the certifications to prove it. You may think otherwise due to their widespread success; but Naturepedic wasn’t founded by a mattress industry bigwig, or even a young hotshot wanting to hop on the bandwagon. Founder Barry A. Cik is actually a 30-year veteran of the environmental engineering field, and the idea for the company came to him in 2003, around the time his first grandchild was about to be born. Searching for a safe crib mattress for the anticipated little one brought only disappointment. Cik noted that most of what was on the market may contain unsuitable materials or harmful chemicals; and even organic counterparts were lacking, as most were not waterproof. Cik and his two sons eventually got themselves into the mattress manufacturing field, creating high quality, natural, non-toxic and sustainable crib mattresses—later on expanding to other bedding and bedroom products for sleepers of all ages. Today, Naturepedic is one of the most popular and most awarded organic mattress companies in the world; but how does one of their most well-loved products stack up against competitive crib mattress offerings these days? Below, we take a close look at the Naturepedic Lightweight Organic Cotton Classic crib mattress. Few mattress companies are as forthcoming and transparent about their research, design and manufacturing practices as Naturepedic. Their mattress design process benefits from the input of chemists, engineers, parents and pediatricians—and are coordinated and backed by an Ohio-based facility specializing in the analysis of potentially hazardous and toxic substances: G.E.M. Testing Engineering Labs. All mattresses are made in the USA; constructed in Chagrin Falls, Ohio by Amish craftsmen in a Global Organic Textile Standard (GOTS) certified factory. All Naturepedic products are UL/GREENGUARD Gold-certified and Consumer Product Safety Improvement Act of 2008 (CPSIA) compliant, as well. There is a noticeable lack of a CertiPUR-US compliance, but with good reason—CertiPUR-US only applies to polyurethane foam, which Naturepedic does not use. Instead, the company follows and holds a certification for the much more stringent Global Organic Latex Standard (GOLS). As for Naturepedic’s organic claims, we’ve found that there is more than enough information to back that up. The company and all their products are OCS100 Organic Content Standard compliant, MADE SAFE certified as non-toxic, and verified as non-GMO and formaldehyde-free in compliance with GOLS and GOTS. In addition, the natural latex and wood used in their manufacturing process go through a single chain of custody as certified by the Forest Stewardship Council (FSC) and Rainforest Alliance. Unlike most mattresses, the interior of the Naturepedic Lightweight Organic Cotton Classic isn’t arranged in layers like you would see in a cross section of a cake; but more like layers you’d see in a slice of turducken. (Excuse the food comparison! We’ve found that it’s the most effective at getting the point across, barring the image below). Here are the specific details about each encompassing layer. A clean and white stain resistant mattress cover made of organic cotton fabric with a waterproof and food contact-grade polyethylene coated surface encases the entire product. This patented cover with heat sealed seams is hygienic, easy to clean and also doubles as a dust mite and bedbug barrier. Naturepedic also takes being hypoallergenic to the next level; as the mattress cover is also free fromorganic but possibly allergy-inducing materials; like natural latex, soy or wool. A firmness layer made of more food contact-grade polyethylene is found right underneath the cover, likely to add stain resistance and waterproofing support, as well as provide structure to the shape of the crib mattress. Organic cotton batting follows. What is batting? Simply put, it’s layers of fibrous material typically used for lining or stuffing. Naturepedic uses two types of batting for their products; this one and PLA batting made from similarly non-GMO sugarcane. Both are sustainable and do not off-gas or even contain chemicals that may be harmful to your little one. The unique core of the mattress again features polyethylene, this time in Naturepedic’s patented Wavesupport technology configuration. As you can see in the image below, it’s a simple arrangement of the material that nonetheless is said to provide top notch durability, strength, stability and support. In lieu of support foams or innersprings, this is the firm but comfortable foundation of Naturepedic Lightweight Organic Cotton Classic. First of all, we should mention that we are reviewing the Naturepedic Lightweight Organic Cotton Classic, one of three offerings in the Naturepedic No-Compromise Lightweight product line. The others are 2-Stage versions, with dual-sided designs marketed for longevity—comparable to the usable lifetime expected of the Colgate Eco Classica III and the Moonlight Slumber Little Dreamer. Compared to the Classic version, they are more expensive; though you may want to look into those option if you are not on a budget and want to make sure your crib mattress is ready for heavy duty use through the years. 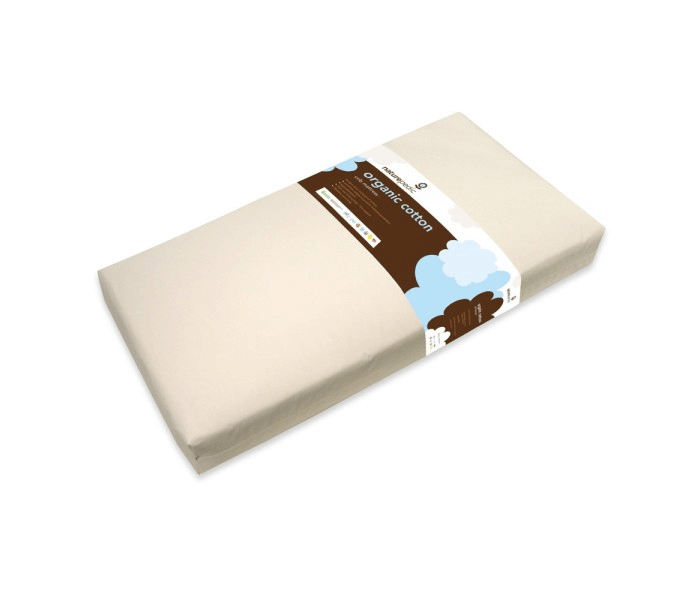 The Naturepedic Lightweight Organic Cotton Classic is available in standard crib mattress size: 27 ¼ x 51 ⅝ x 6 inches. As it is truly lightweight at only about 10 pounds—the 2-Stage version is a few pounds heavier—cleanup and crib sheet changing will be a breeze for moms and dads. CPSIA compliance means that all Naturepedic crib mattresses should fit in any crib of standard size; but there may be exceptional cases, especially since standard crib size has an acceptable range and is not exact. This is actually the subject of about half of the negative reviews we’ve seen regarding the Naturepedic Lightweight Organic Cotton Classic—that it is a little too small—though to the company’s credit, each complaint has been answered by a support representative reminding customers of the applicable lifetime limited warranty, which we will discuss later on. Back to what can be used with the crib mattress: Its fit in the crib should be safe and snug! 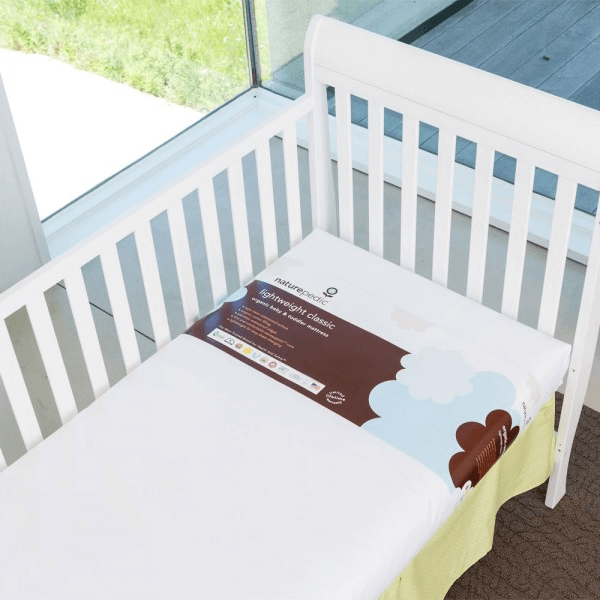 Should you be unsure of the safety that the combination of your crib and crib mattress provides, do perform the two finger test so you can ascertain if there’s too much space between the Naturepedic Lightweight Organic Cotton Classic and your chosen crib. If there’s a width of more than two fingers, it means that the products are not compatible! Please change one of the two in order to avoid accidents and ensure that your little one comes to no harm. Also: Some baby monitors make use of breathing and movement sensors that don’t work well with hollow core mattresses—and Naturepedic’s patented Wavesupport technology configuration might count, though we’ve combed customer reviews and this doesn’t seem to come up as an issue at all. How Easy Is It to Set Up and Clean? Like many crib mattresses, the packaging is frustration-free and very simple. Just unbox and set up in your crib! No off-gassing and no need to let it sit in a well-ventilated place before use. Cleanup, as we’ve mentioned above, should be just as easy. Naturepedic Lightweight Organic Cotton Classic is waterproof and stain resistant, and while the cover is not removable or machine washable; cleaning is as simple as wiping the surface with a damp cloth. If soiled and needing extra sanitizing, you can add a mild cleanser to the mix. Naturepedic crib mattresses can support up to approximately 50 pounds; well over the average weight of a three-year-old, an age that marks the endof your little one’s toddler years. The company is one of the few to outright list a weight limit, which we appreciate. However: Along with the crib mattress size, mattress warping due to inadequate weight support is another issue that negative customer reviews seem to focus on. There are reports of craters, dips, and sags that appear even before the first year of use; however, each complaint we’ve seen about thisis again answered by a support representative with an apology and a warranty reminder. This tells us that warping when the weight supported is within set limits is definitely covered by the Naturepedic warranty. It feels like all crib mattresses should feel: firm! Infants are not safe when they sleep on a soft surface, because there’s always a risk of suffocation or other dangers. 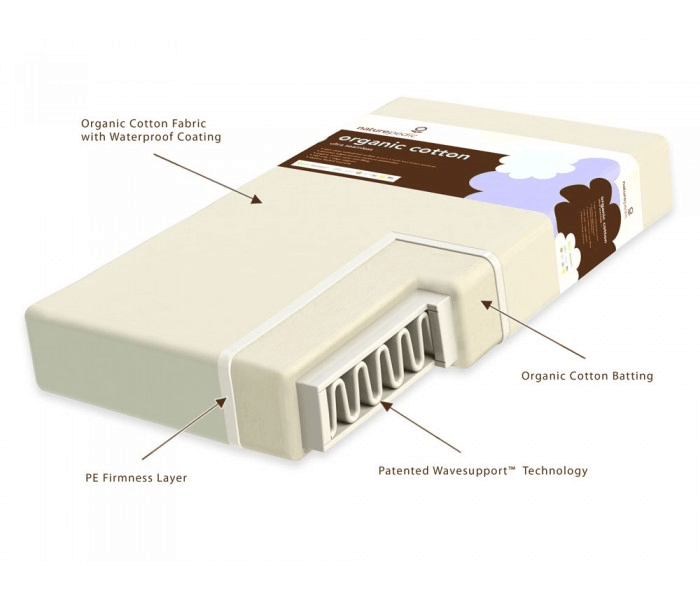 A few parents that have reviewed the Naturepedic Lightweight Organic Cotton Classic online have commented that the firmness of the product seems excessive—likening the hardness of the surface to brick or plywood—but only a small percentage add that the firmness is the cause of their little ones losing sleep. Our take? Unless your child refuses to sleep on it, it’s not too firm. Other than the “comfort level”, there are no other alarming feel-based complaints; nothing about heat retention, allergies, or the like. With a commitment to environmentally sound manufacturing of organic and sustainable products backed by certifications and transparent business practices—not to mention a steadily expanding product line that now features mattresses and bedding accessories for all ages—there’s little to complain about when it comes to Naturepedic’s promise and potential. If there’s one nitpick, it’s that their customer support could be more extensive and helpful. It’s true that each complaint we’ve seen online by verified customers has been answered attentively, but there is a very obvious lack of an extensive FAQ on their official website. While Naturepedic does have many avenues of direct contact with their support team available—a contact form on the site, an email, and a telephone hotline with EST business hours—a consolidated help section would also be great. Note that they do still have the information that you would expect from an FAQ available, just found in different pages all throughout the site. There is one kind of negative feedback that we think is worth mentioning: Some customers have complained that upon contacting the company about discrepancies in crib mattress size, the response included an admission about Naturepedic mattresses being incompatible with some crib brands, like Pottery Barn. While we understand the frustration this can cause, there really is nothing Naturepedic can do in instances when their product is not defective. If the Naturepedic mattress a customer is complaining about is indeed smaller than usual, then they can replace it; but if it’s standard, the fault must lie in the crib being used. There is a return policy that comes with a 30-day money-back guarantee; as well as a damaged shipping policy! These only count if you purchase your Naturepedic crib mattress directly from them, though. If you purchase it elsewhere, the return policy of the retailer in question is the one that will apply. Remember when we noted above that one of the complaints was the inordinate firmness of the crib mattress? If it’s too firm for your baby, it shouldn’t take more than a month to figure it out. However, should you decide to return the product to Naturepedic, you do need to shoulder shipping costs. As for the damaged shipping policy: You need to refuse the shipment and have it clearly marked as severely damaged upon delivery, and then notify Naturepedic within 72 hours to file a claim. There is a limited lifetime warranty! It works like most mattress warranties: Only applicable if you are the original owner, covering manufacturing and material defects only, and voided with improper use or abuse of the product. Replacement and repair is up to Naturepedic, although they may replace your crib mattress with a similar or higher quality item instead of the exact same product. And of course, you will need to properly register your Naturepedic product on their official website for any of this to matter. The Naturepedic Lightweight Organic Cotton Classic is listed as $259 on their official website. While it’s available at a slightly lower price on Amazon, we recommend you buy it directly from Naturepedic. The price is a little steep, especially when you consider that this isn’t even a 2-stage version of the design! However, it is still reasonable when you factor in the certified organic nature of the product; plus the additional security and value for money you get with the included return policy and money-back guarantee. If you’re looking for a crib mattress that is truly organic—not just “eco-friendlier” or described as such by similar buzzwords—look no further. We do love sustainability and safety, so maybe we’re being a little more lenient with Naturepedic in this review than we should be. After all, there were some valid issues raised in the negative feedback we found online about this product! However, we believe that Naturepedic’s customer support is well-equipped to handle any possible problems that may arise. The return policy and guarantee also do a lot to assuage our fears. This is not a budget option by any means, but it is more than worth its price if going all-natural is your goal.